Bees continue to disappear from their hives, but those kept by artisanal producers are hanging on—and making fabulous honey. Here’s F&W’s guide to the best, plus eight delicious honey-centric recipes. The past few years have been tough for bees. In 2006, beekeepers around the country began finding abnormal—no, paranormal—numbers of hives abandoned by adult honeybees, their brood and honey left behind. Last year, some 20 billion bees vanished. Like the Mayans and the Brooklyn Dodgers, they exited swiftly, without warning. The bees keep disappearing, and Colony Collapse Disorder (CCD) continues to make headlines. Since one-third of the U.S. diet—especially vegetables, fruits and nuts—involves bee pollination, the agriculture industry is unsettled: no bees, no crops, period. As researchers and apiarists scramble to pinpoint what triggers CCD—so far, the list of possible causes has only grown—the epidemic has helped draw attention to an industry in distress. Only recently has there been enough money to do the research, thanks to donations by companies like Häagen-Dazs, whose Häagen-Dazs Loves Honey Bees program has so far donated $250,000 for CCD research. All of us can help the bees as well, by planting a garden and forsaking harmful pesticides. At the same time that bees in commercial operations are facing their biggest threat, the bees managed by artisanal honey producers are hanging on. A growing number of small-scale beekeepers are specializing in single-varietal honey—honey made from the nectar of a single flower variety—and their bees haven’t been as affected by CCD. These varietal honeys are as varied and complex as varietal teas or wines—buckwheat is to clover as Zinfandel is to Riesling, for instance—and they’ve inspired new ways to cook. 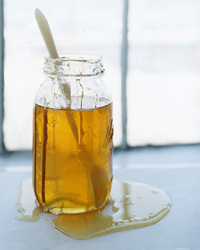 We asked cookbook author Susan Spungen to create sweet and savory recipes that showcase the unique characteristics of different varietal honeys. The result is an astonishing assortment of dishes, from luscious baby back ribs brushed with a sticky honey-tamarind barbecue sauce to a creamy goat cheese tart drizzled with a warm honey caramel. Just a few more reasons we need to save our bees.